Virtua Racing Sega Genesis Game cartridge Cleaned, Tested, and Guaranteed to work! Sega charged $100.00 for this game simply because it contains the FX/SVP chip. Sega could've learned something from Nintendo. Nintendo never charged even one penny extra for games with the FX chip. Virtua Racing has only one car to drive and only three tracks to race on. I prefer Stunt Race FX because it has three different cars to choose from and eight tracks to race on. 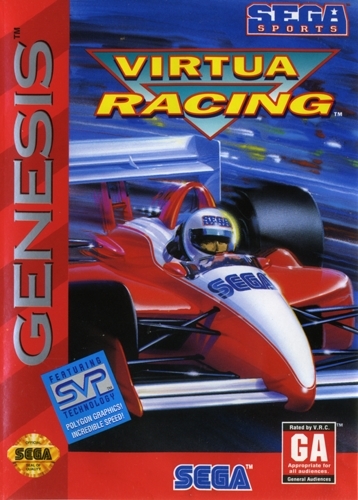 Unlike every other Genesis game, Virtua Racing can not be played if you have the 32X attached to your Genesis. The reason why it isn't compatible with the 32X is probably because of the SVP chip. 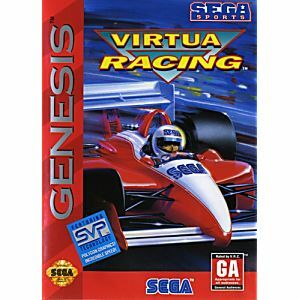 If you have the 32X attached to your Sega Genesis, buy Virtua Racing for it instead. The 32X VR is much better than the Genesis version. The 32X VR gives you three cars to choose from and more tracks to race on.